FLORIDA REPUBLICANS RUSH TO DEFEAT ASSAULT WEAPON BAN. “Less than a week after 17 people were fatally shot at a Florida high school, the state House has voted down a motion to take up a bill that would ban assault rifles, effectively killing the measure for this session,” the AP reports. The motion failed by a 36 to 71 vote, with 13 not voting. Every NO vote came from a Republican. Every one. And they voted no in front of 100 students from Parkland who had traveled to Florida’s capital today in the hopes that the state legislature would act on an assault weapons ban in the wake of the school shooting last week. TRUMP WANTS TO BAN BUMP STOCKS. President Trump said that he signed a memorandum directing Attorney General Jeff Sessions to craft regulations to ban “bump stocks” and other devices that turn semi-automatic firearms into automatic weapons, the Washington Post reports. I will want to commend Trump until I actually see the regulation enacted. A Memo ordering Sessions to come up with such regulations is not the same as an Executive Order banning them outright. PENCE AND NORTH KOREA ALMOST HAD A SECRET MEETING. Vice President Pence “departed for a five-day, two country swing through Asia earlier this month having agreed to a secret meeting with North Korean officials while in South Korea at the 2018 Winter Olympic Games,” the Washington Post reports. DEMS MAINTAIN MASSIVE LEAD, AND LARGE MAJORITIES WANT ACTION ON GUNS. A new Quinnipiac poll finds American voters prefer Democrats in control of Congress by 15 points, 53% to 38%, including independent voters by 47% to 36%. For comparison, the FiveThirtyEight polling average shows Democrats with a 48.3% to 39.7% lead. The same Quinnipiac poll also finds American voters disapprove of President Trump’s plans for a military parade, 61% to 26%. Every listed party, gender, education, age and racial group disapproves except Republicans, who approve 58% to 24%. Further, the poll finds American voters support stricter gun laws, 66% to 31%, the highest level of support ever measured by the poll, with 50% to 44% support among gun owners and 62% to 35% support from white voters with no college degree and 58% to 38% support among white men. In addition, Americans support a nationwide ban on the sale of assault weapons, 67% to 29%, and a mandatory waiting period for all gun purchases, 83% to 14%. Support for universal background checks is itself almost universal, 97% to 2%, including 97% to 3% among gun owners. A new Washington Post-ABC News poll finds that 77% of Americans say Congress is not doing enough to prevent mass shootings and 62% say the same of President Trump. But Americans are roughly split on an assault weapons ban, with 50% in support and 46% opposed, a stark contrast from the 80% support for the ban in 1994, the year it was enacted. The current level of support is little different from 51% in 2016. In light of the Mueller indictment, it's time to revisit that episode where leading Republicans refused to show a public, bipartisan united front against Russian sabotage. By blasting Obama, Trump has unwittingly invited this inquiry. MANAFORT TRANSACTIONS UNDER NEW SCRUTINY. “Federal law enforcement officials have identified more than $40 million in ‘suspicious’ financial transactions to and from companies controlled by President Donald Trump’s former campaign manager Paul Manafort — a much larger sum than was cited in his October indictment on money laundering charges,” BuzzFeed Newsreports. GOP: An AR-15 isn’t even an automatic weapon. You can’t regulate from a position of ignorance. ME: [pulls out paper and pencil] Please draw, label, and explain the female reproductive system. Good one! Ten points plus. But apparently assault rifles are low risk. 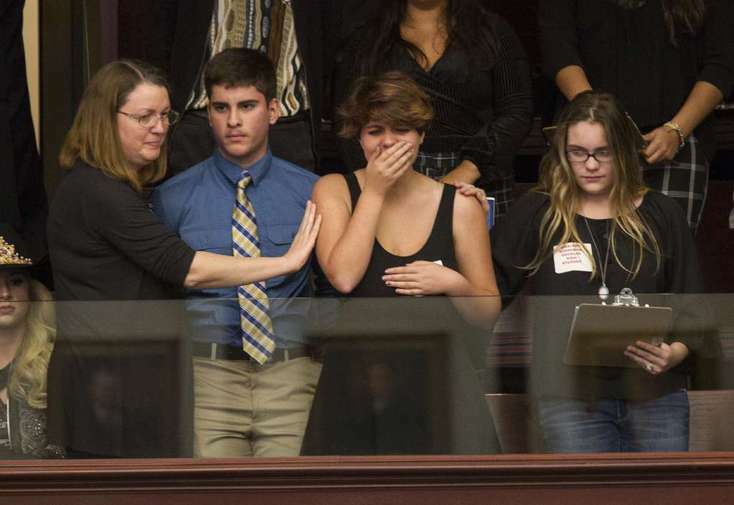 Florida students marched on the Florida state capital in Tallahassee to see “their” representatives vote down a ban on semi-automatic rifles and large capacity magazines. When appealing to the better nature of an NRA owned government, it wastes no time in mooning in you.